Lovely pool. Very spacious apartment. Excellent location in a lovely village. very good location. nice clean hotel. this is a very quiet hotel .no noise to be made 2 till 5.30 or after 11pm. We upgraded to the villa which was totally amazing. The owner was so helpful. The best villa I’ve ever stayed in and worth every penny. Extremely well maintained and decorated. Spotlessly clean and well kept. Pool especially very safe and in very good repair. Very good facilities for small apartment complex. Parking was a huge bonus. Nice large room, air conditioned, private patio, nice swimming pool with plenty of sun loungers, 5 min walk to beach & reasturants. Nice Library, good selection of books . The room was very comfortable and the location was amazing right next to the main square. Free parking is also provided! The property is in a great quite position and so close to all the shops restaurants and the beaches. Great beach for snorkelling with octopus moray eels crabs conch snails etc. Will definitely go back again just for its position to everything and the staff were great and so helpful. Big, clean, modern and well-equipped apartment close to the restaurants and beach. The owner was helpful. The pool area was nice and clean. Very helpful host , Manolis. Clean and cosy apartments with nice pool and close to both beaches of Panormos. Lock in a great price for Philoxenia Apartments – rated 9 by recent guests! One of our best sellers in Panormos Rethymno! 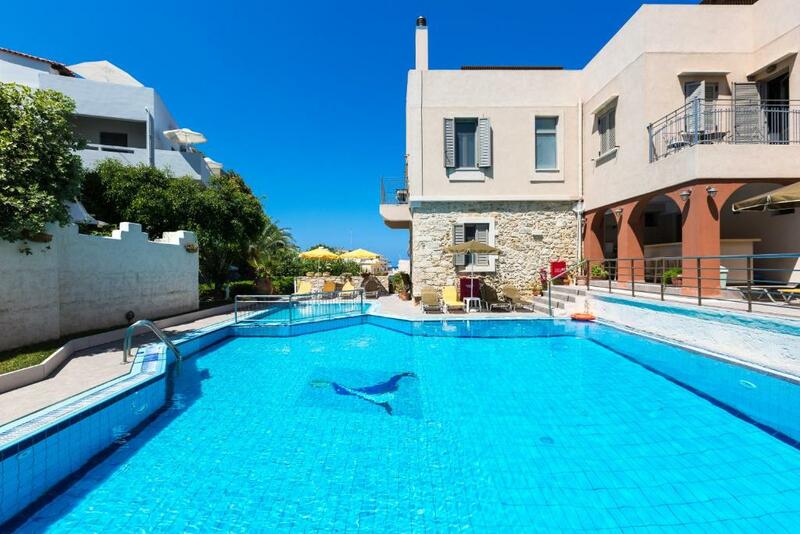 Just 150 feet from the village square and 650 feet from the beach, the Philoxenia Apartments have a prime location in Panormos and comfortable apartments with kitchen facilities and an outdoor pool. These spacious and comfortably furnished apartments have an ideal solution for a peaceful and relaxing break in Panormos. Each apartment is well-furnished with modern bathroom, kitchen facilities and a dining area. During the day, soak up the sun around the pool, read a book in the shade of the sun umbrellas or enjoy a drink on Philoxenia’s terrace. Stroll along the charming cobbled streets of Panormos and discover the local taverns, traditional craft stores and cute bakeries. There are also a variety of bars for evening entertainment. If you are exploring Crete by car, you can receive free private parking at Philoxenia Apartments. When would you like to stay at Philoxenia Apartments? Features private balcony with view of the village and the grounds. Features private balcony with view of the village, the mountain, the pool and the grounds. This apartment includes 1 separate bedroom and a spacious porch with views of the Panormos village, the pool and the complex’s garden. This spacious one-bedroom apartment has sea, mountain and village views. House Rules Philoxenia Apartments takes special requests – add in the next step! Philoxenia Apartments accepts these cards and reserves the right to temporarily hold an amount prior to arrival. Balcony was hidden behind a tree do no direct sunlight or view. Did not particularly like the apartment but it was good value for money. Comfy beds! Best I’ve had in Greece! All the cats located near the apartment. the bed wasn't very comfortable. Steep steps to go down to the pool, wouldn't recommend to anyone who had difficulty with climbing stairs. Our room was not cleaned for our whole stay of 10 nights, only received clean towels & bed linen once!! I was charged twice, even tho I had told them I had already paid!!!! Loved the Village, many beautiful restaurants, only a short walk to the beach & our favourite restaurant, The Anchor, went there most days, was excellent!